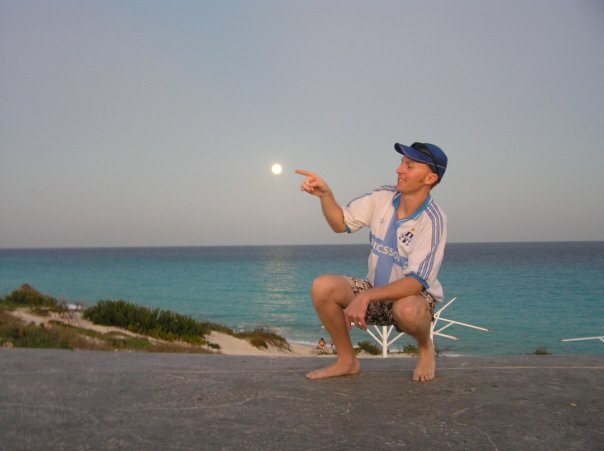 Some years back I got a job working in a hotel (aka “The Club,” and “The Village”) on the Pacific Ocean side of Mexico. It wasn’t like working at Denny’s. In this job you didn’t clock in or clock out. It was a job where I lived in the hotel and pretty much got paid to hang out with the guests of the hotel and party with the other employees of the hotel. I started out working in reception. As I got to know more people at the Club, I met some several Mexican employees who lived in California, Chicago, and Texas but had extensive family in Mexico. One of them was my roommate. He was also the Village Animator (guy who makes hotel guests laugh). He had been raised in El Paso but most of his family members were from Ciudad Juarez. He had such striking features that he looked like a cross between Moctezuma and Jackie Chan. His name was Gabriel and he was always keen to talk about his experiences in film-making. His most famous story was how he got the job as the stand-in for Edward Norton on the movie 25th Hour. First, I had to ask Gabriel what a stand-in was. He explained that in movies, as well as TV shows, famous actors like Bill Cosby or Marlon Brando don’t like to stand around for 20 minutes while photographers adjust the lighting and the co-stars practice their lines. What a stand-in does is dress up like the lead actor and say the lead actor’s lines so the rest of the cast can rehearse their lines before filming. The 25th Hour is a movie directed by Spike Lee about a three strikes drug offender in New York who has one day left to live as a free man before being sent to jail for life. In the movie, Edward Norton flees to the El Paso desert to avoid serving life in prison. The dessert scenes are shot in the harshest most remote parts of the El Paso dessert. No New York actors were willing to travel to El Paso just for a small role as the stand-in. Gabriel knew this so he sent his resume to Spike Lee’s production office. Spike Lee’s production assistant called Gabriel a few days later. She thanked Gabriel for submitting his resume but explained that unfortunately the stand-in role was already filled. “Who got the role?” asked Gabriel. “I’m tall, dark and handsome.” claimed Gabriel. When Gabriel came to the set in the El Paso desert the next day, he met the production assistant and was given a walkie-talkie and told he would be notified when it was time to work as the stand-in. He clipped the walker-talkie onto his belt and went to the catering truck to get some food and water. While he was waiting in line a voice started radiating out of the walk-talkie, it was Spike Lee. “Where is Edward Norton’s stand-in?” asked Spike. “He’s over at the catering truck.” Replied the production assistant. “You hired a Mexican as a stand-in for Edward Norton?” asked a totally flabbergasted Spike Lee. That’s how Gabriel got his role of stand-in for Edward Norton, even though he had no idea who Richard Jenkins was and looked nothing like Edward Norton. Gabriel was one of my closest friends in Ixtapa and whenever his mom came to visit from El Paso she’d always call us first and ask what she could bring down from the US for me. One time, half-jokingly, I said I wanted a croquette set. A couple days later Gabriel walked into our room holding this huge box from the airport, wrapped in tape, showing that it had been inspected in Mexico City by customs. When I opened it up, sure enough, his mom had sent me a croquette set from Texas. Gabriel knew all the Mexican slang, so each day after work I’d come back to the room with a list of phrases I which I didn’t understand. I’d start from the top, what does, “¡No friegues!” mean? Gabriel was one of the most popular employees in the village. A lot of the times I wouldn’t get invited to the parties that the employees had organized around the town or in the village, but Gabriel would always come to the room before he left and ask me if I wanted to come with him. Each time he asked, I told him I would go with him the next time. Before I knew it, two months had passed and I had never even left the village. All I knew about the outside was what I had heard from the other employees when they talked about going out. One night Gabriel came into our room in the middle of the night and turned on the light. I woke up to see him eagerly brushing his teeth and fixing his hair. He was very excited. He explained to me that he had five girls from Vancouver waiting in reception. He had invited them to go to Carlos ‘n Charlie’s that night. How could I say no? We walked up to reception together and took a taxi to Carlos and Charlie’s, which was about 10 minutes from our hotel. When we got to the discothèque, there were at least 1500 people inside. Carlos and Charlie’ in Ixptapa has two stages for dancing with a pool in the middle of them. There were so many people there I didn’t realize that we were right on the beach because I couldn’t see further than about four or five heads. The first thing that happened was that someone came along with a clear kettle and started pouring shots into all our mouths. I drank up but couldn’t keep anything straight about what was happening around me. We danced with the girls and hung out with all the other hotel employees who were there. The night was a success. After leaving the disco, we all grabbed a taxi and headed home. I must have fallen asleep in the taxi because the next thing I remembered was waking up on the bed between the two girls from Vancouver. I was still wearing the clothes I had been working in earlier that day, which was the only information I had. I looked up and could see that Gabriel was busy talking to the three other girls on the porch. One girl rolled over and asked me, “Do you always sleep with your hand down the front of your pants?” I looked down and saw, to my dismay, that I had my hand buried down the front of my pants. I quickly sat up and joked about the different sleeping positions men utilize while sleeping. 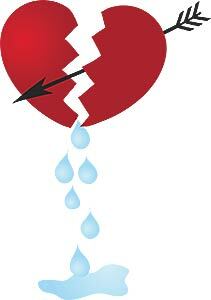 Not wanting to further make a fool of myself, I parted amicably. From that night on, Gabriel became my wing man. Our goal was simple: We wanted to go to as many beaches/discotheques and chat with as many women as possible during our stay in Ixtapa. Like me, he had never been to Ixtapa-Zihuatanejo before and together we knew almost nothing about where we were living. Ixtapa-Zihuatanejo are located 100 miles northwest of Acapulco on the Pacific coast of Mexico and are less than four miles apart. Zihuatanejo is known for its traditional Mexican charm, a place where most families still derive their income from fishing. On the other side of the spectrum is Ixtapa, a modern city that has only been around only since the 1970’s and exists solely to entertain tourists. 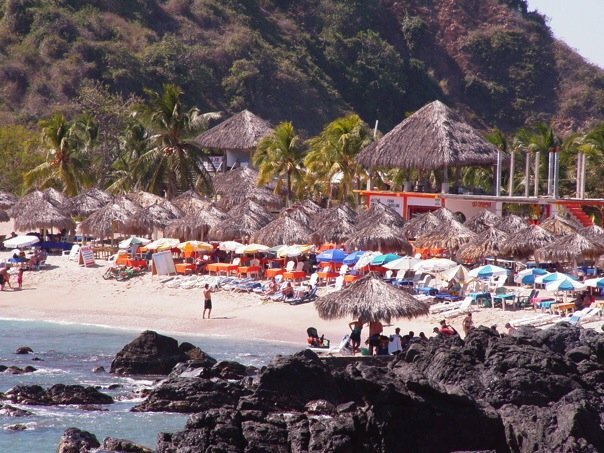 Ixtapa derives its income from the bars, discothèques, hotels and golf courses that dominate the landscape. 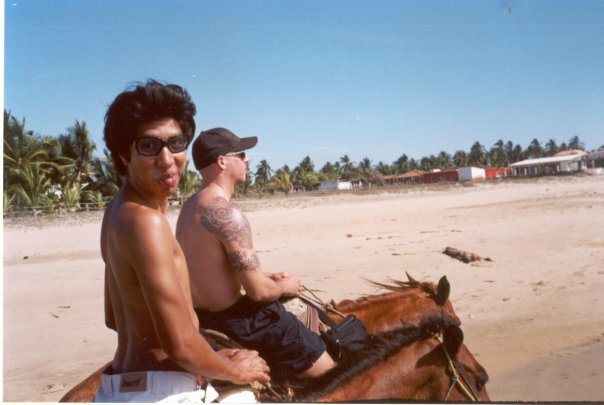 For our first beach excursion, Gabriel and I took a taxi to a crocodile farm at Playa Linda. Luckily we arrived during feeding time. The man who takes care of the crocodiles is the town eccentric. His name is Tamacuna and he is an old Mexican shaman with long grey hair that is held back by a yellow sweat band. Although his duties are limited to feeding and caring for the reptiles, he does his job dressed as famous Mexican soccer player Luis Hernandez, complete with uniform, cleats and shin guards. 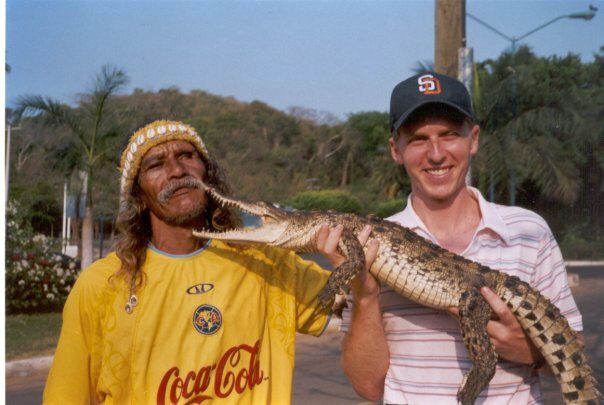 If you pay Tamacuna a dollar, he will let you take a picture of him putting his head inside a crocodile’s mouth. He carries a baby crocodile around in his backpack. While feeding the adult crocodiles in Playa Linda, he takes the baby crocodile out of his backpack and passes it around to the old ladies. If the ladies refuse to hold the baby croc, Tamacuna threatens to put a spell on them. Very few of the women refuse to hold the baby crocodile. An aerial view of Mexico City is like peering into the insides of a hallowed-out pumpkin. The numerous highways and neighborhoods tangle together like a pumpkin’s matted intestines. There is no wind in Mexico City. The sweat, humidity and smog stick to your clothes, your windshield and your pets. The Aztecs knew Mexico City as Tenochtitlan, the city that sat atop Lake Texcoco. The lake is long gone, and the city is slowly sinking into the void. A tour to the Zocalo (historical center of town), will reveal a bewildering finding. The window lines of the buildings start to sink towards the middle, like an accordion full of water. Mexico City has so many people, it has run out of phone numbers to give to the residents of the city. Unlike the United States, which uses various area codes for one metropolitan area, Mexico City uses the same prefix for the entire city (55). TelMex (Mexican AT&T) had to expand to an eight-digit telephone numbering system to satisfy the demand. Mexico City’s population is larger than Los Angeles, San Francisco and San Diego County, combined. Adding another strain on the city’s bursting seams, Mexico City’s municipal government cannot expand the subway system. Each time construction begins to break ground, the tractors expose sunken pyramids that nobody knew existed. Even construction that only involves removing a few feet of soil is tedious. Construction workers all over complain about how many days are lost clearing all the Aztec artifacts that saturate the soil strata well beyond the borders of the city. Most artefacts retrieved from construction sites are mixed in with the construction waste and deposited into the city’s dumps. Even the Headdress of Moctezuma, the crown of the Aztec ruler of Tenochtitlan, has a story behind it. 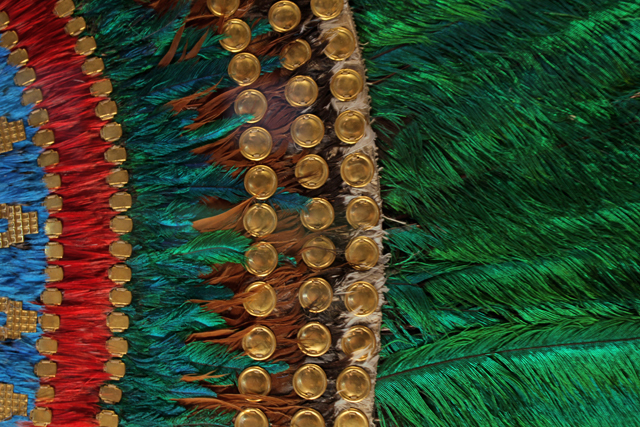 The headdress dates from 1502 and contains more than 500 quetzal feathers, a native bird species from the Southern part of Mexico and Central America. The headdress can be visited at the National Museum of Anthropology in Mexico City. The only problem is that the Headdress is a fake. Hernan Cortes stole the original from Mexico over five centuries ago. After being stolen from Mexico, nobody quite knows what happened after that. All that is known is that the headdress was purchased by Austria in 1880 and has stayed in their country ever since. One theory of how the headdress ended up there was that while the headdress was being sent to Spain by boat, the boat was attacked by French pirates and brought to France where it stayed for over three centuries. It was later auctioned off to Vienna. Now that the headdress is known to be on display in Austria, the Mexican government is demanding its return. Austrian President Heinz Fischer has warned that the return of the headdress would only lead to a flood of similar claims from countries all over the Americas to recover valuable Pre-Hispanic artefacts illegally taken from their land. The logic of such a statement isn’t lost on Mexico, only temporarily misplaced.